We offer specialized medication packaging using the DISPILL system to enhance medication compliance and easily distribute your medications. DISPILL multi-dose packaging offers you an easier and safer way to take your medications. You will wonder why you never tried it before. DISPILL multi-dose packaging bundles your medications together by date and time and color coding. For example, all your medications that are to be taken in the morning will be packaged together in one yellow bubble. 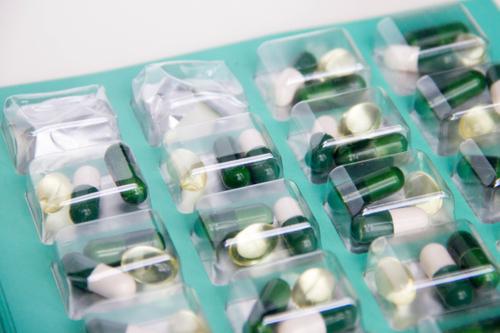 Say Goodbye to pill boxes and all of your pill bottles, and say hello to multi-dose packaging. Refills are generated monthly, all refills are handled by our staff. You never need to contact your physician or make multiple trips to the pharmacy again! Visit Dispill-USA.com for more information or ask any of our staff today about our pill-packaging service and how you can get signed up. Let us know how you enjoyed your pharmacy experience here at Simpsons Pharmacy.